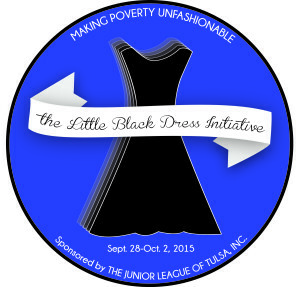 This month, the Junior League of Tulsa will introduce the Little Black Dress Initiative (LBDI)—a new social media-fueled fundraiser. Before it begins, learn all the essential details here. 1. What is the Little Black Dress Initiative? LBDI is a poverty awareness and fundraising campaign that underscores the Junior League of Tulsa’s mission to end the cycle of poverty in Tulsa. Each participant wears one black dress for five days to illustrate the effects poverty can have on a woman’s access to resources, confidence, and opportunities. Or if a black dress doesn’t fit the participant’s lifestyle, she may wear some variation of a black ensemble throughout the initiative. Participants will receive a LBDI button to wear each of the five days and will spread the word about the campaign through social media, using #JLTwearsLBD. 2. Why is this campaign necessary? Oklahoma’s citizens are increasingly suffering from food insecurity and homelessness. Oklahoma ranks worse than national numbers in overall poverty rates and child poverty rates, according to 2013 census data. Tulsa County’s profile matches that of the state as a whole, with 16.1% of the overall population living below the poverty line and 24.3% of children living in poverty. Our city’s numbers are even more sobering. The 2013 poverty rate in Tulsa was 19.7%, meaning approximately one in five residents were living below the poverty line. In Oklahoma as a whole, 18.3% of women live in poverty. For a more detailed look at poverty in Tulsa, be sure to read our recent article on the subject. 3. When does the LBDI begin? The campaign will run from Monday, September 28 to Friday, October 2. There also will be a kickoff event at The Vault (620 S. Cincinnati Avenue, Tulsa) on September 25 at 7 p.m. This event will be Dutch treats dinner and drinks. Dates are welcome, but be sure to RSVP for both you and your date through Digital Cheetah. This fundraiser is open to everyone, not just JLT members. Event chair Tara Proctor explains, “This is a campaign to raise public awareness not only about poverty, but also the work JLT does to help eliminate poverty and its effects in Tulsa.” She encourages involving coworkers and family members in the initiative. 5. How do I sign up? JLT members can sign up by following this link to register in Digital Cheetah. There also will be sign-up forms at the September General Membership Meeting (GMM). It costs nothing to participate. 6. How do I donate? Donate by visiting the JLT website and clicking on the fundraising tab. 7. Do you have tips on how to fundraise? Shortly after signing up, you will receive a how-to guide with suggested e-mails and Facebook posts. For more information, contact Tara Proctor at tara.l.proctor@gmail.com.